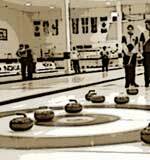 Tradition has it that this sport originated in Scotland from a popular pastime where various objects were thrown along the ice and gradually as the rules were made more precise this pastime turned into a sport. The exact time when this occurred, however, is not known. There are various disagreements about it. One of the oldest is the dispute over the validity of the notarial record from a business meeting in Scotland on 16th February 1540 where curling is mentioned. The oldest preserved evidence of the origin of curling could be the curling stone from Stirling which is inscribed with the year 1511. The first pictorial proof of the existence of curling is the painting “Hunters in the Snow” by the painter Pieter Breugel from 1565. A poem written in 1638 by Henry Adamson, in which curling stones (Loadstones) are mentioned, is the first recorded written evidence of curling. Curling can be seen far more in pictures from the 18th and 19th centuries and it is possible to trace its expansion throughout Europe and beyond. In the twentieth century curling diplomacy’s efforts reach a peak with its inclusion in the Olympic Games, firstly as a demonstration sport and then as a full sport. Curling’s main membership base is made up of 1.3 million registered players in Canada. The sport has also become popular in Japan, Switzerland and in northern countries. Among the World Curling Federation’s member nations there are also some exotic countries such as Mexico, others are more traditional such as Scotland and the United States of America. Among the more than thirty member countries the most recent new members are Brazil and Israel. Other countries have also shown interest. This fact proves the popularity of curling throughout the world. Among those interested and the newest members are also our closest neighbours and countries from other parts of eastern Europe.